Here are resources from some of the presentations that I have given. Here resources that you might find of interest and be able to use. There are many links that will take you to posts that house videos, PowerPoint presentation and other resources that you might find useful. Here are even more resources in this Livebinder. Here is my presentation from the Reform Symposium 2013 online conference. Click here to see resources. This presentation was given 10/5/12 at the Louisiana Council of Teachers of English Conference. Click here to see the resources from this presentation. 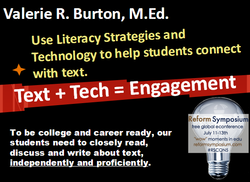 This presentation was recorded for the Sandbox Play thread of the K12 Online Conference 11/23/11. This presentation was delivered at LACUE 11/6/2011. Click here for presentation resources. This presentation was given at LACUE in 2010. 96 minutes, 33 computers and students; whatever shall I do? This presentation was given at LACUE in 2010. Click here for the resources. Communicate with parents and students. 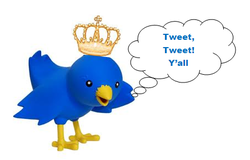 Twitter assignments, important events, deadlines, and more to keep parents and students updated with important information. Click here for slides from my Reform Symposium 2014 ppresentation. 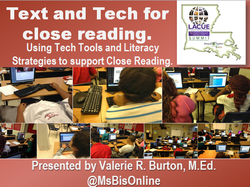 Click here for slides from the LACUE Leader Summit in Baton Rouge. Here is my presentation on the Live.Classroom 2.0 site that shows how to publish work - for you and your students - using Weebly.com. Resources used for LACUE session. This presentation was given for K12 Online Conference. Click here to see the resources from this presentation. Use Weebly.com to share and show off your work. 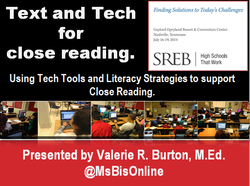 I gave this presentation at the Discovery Educators Network Summer Institute in July, 2012. Click here to see presentation resources. This presentation was delivered at edcampLA July, 2011. 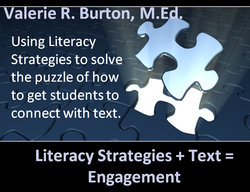 Implementing Literacy Strategies across the curriculum. This presentation was delivered to my faculty 9/15/11. Here are the resources that I used for this presentation. Here are some strategies to use across the curriculum. This presentation was given 4/20/12 for the Classroom 2.0 conference. Click here to see the resources from this presentation. Click here for resources on how to use wikis in your classroom. Trying to use blogs in your classroom? Here are some resources to help. 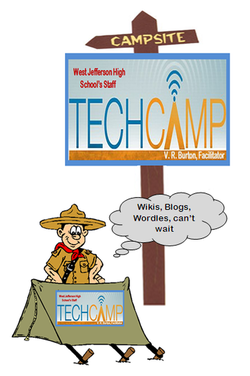 Ideas for creating a TechCamp in schools.